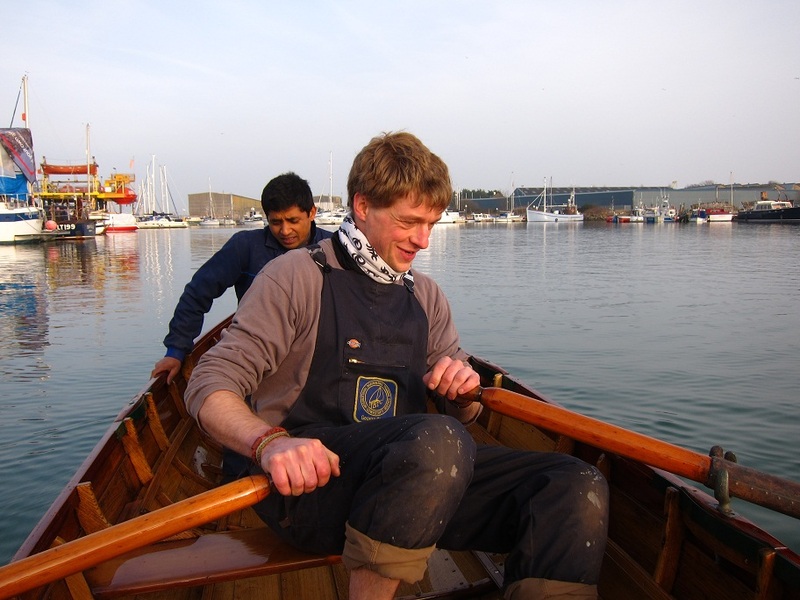 It was a slow journey from the back of the IBTC boat shed to Lake Lothing. It took several days for Germaine to travel the 100 yards or so out of the shed and back into the water. 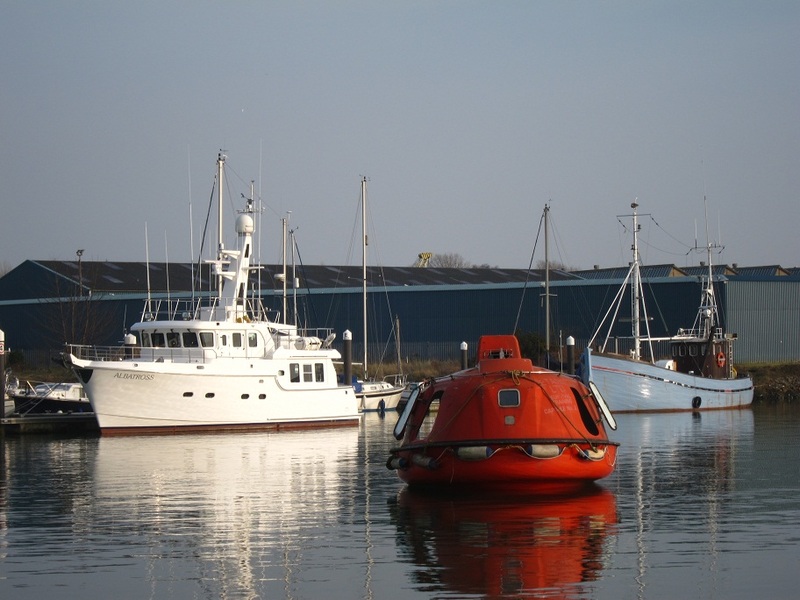 She’d waited 16 years and at 11.00 last Tuesday morning she was back in the water. Awakened at last she made her way across the lake as we watched in admiration. The first stage of her journey started a couple of weeks ago. Her way was blocked by an accumulation of boats of various shapes, sizes and degrees of portability. When they had been lifted, pushed, pulled and rolled out of the way (see Henry’s brilliant shed shuffle), Germaine was ready to glide out of the shed on her wooden cradle. We felt like an Egyptian chain gang as she slid along on greased boards which had to be carried from back to front, but we had some some help from a digger and a for lift truck, which eased the load somewhat. She slid out of the shed and along the hard to the yard next door where she reclined in her cradle for a few days to wait for the big day. She needed a few last minute adjustments of course, and we carried on working on her out in the yard despite the rain. My contribution was very minor, just attaching a couple of fairleads to her stern, but it was nice to be part of it. 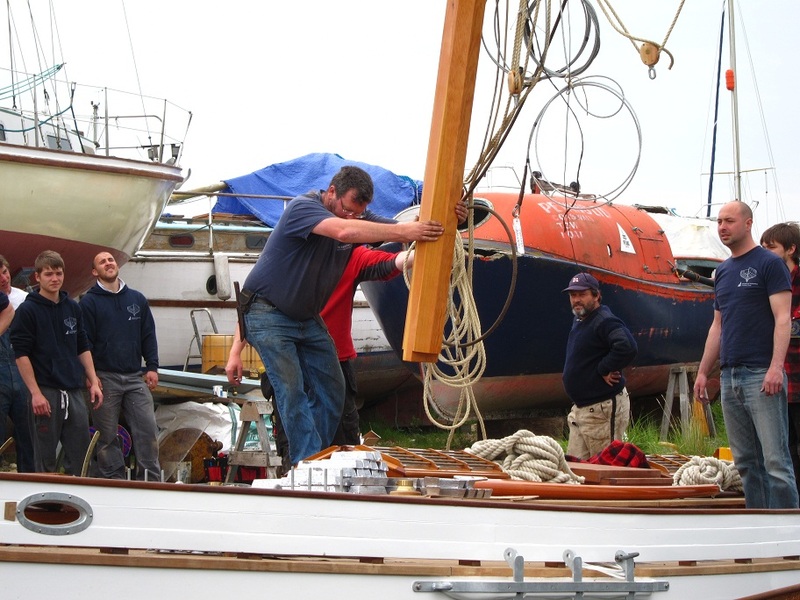 As Ron eased her into the water using the mobile boat hoist, the rigger and his team rigged up the very complicated looking gaff rig on her mast in an impressively short order. 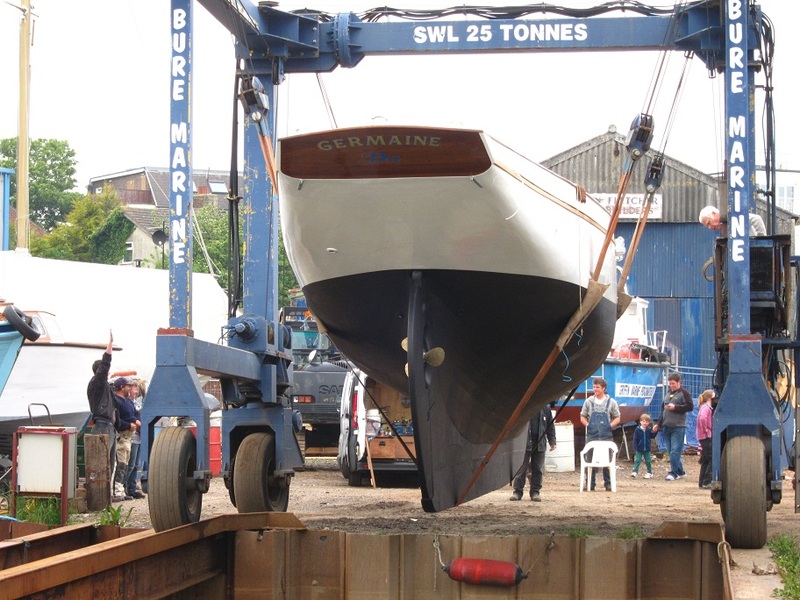 The was hoisted into place and suddenly she was ready for her first voyage across the lake to Haven Marina. We waved her off and cheered. 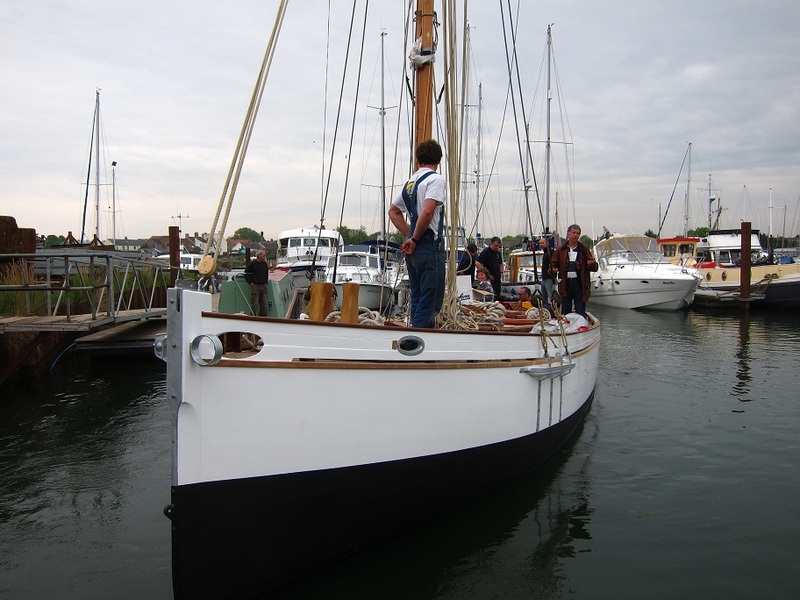 Germaine’s next stop will be Douarnenez later this summer when her rigging and sails have been completed. 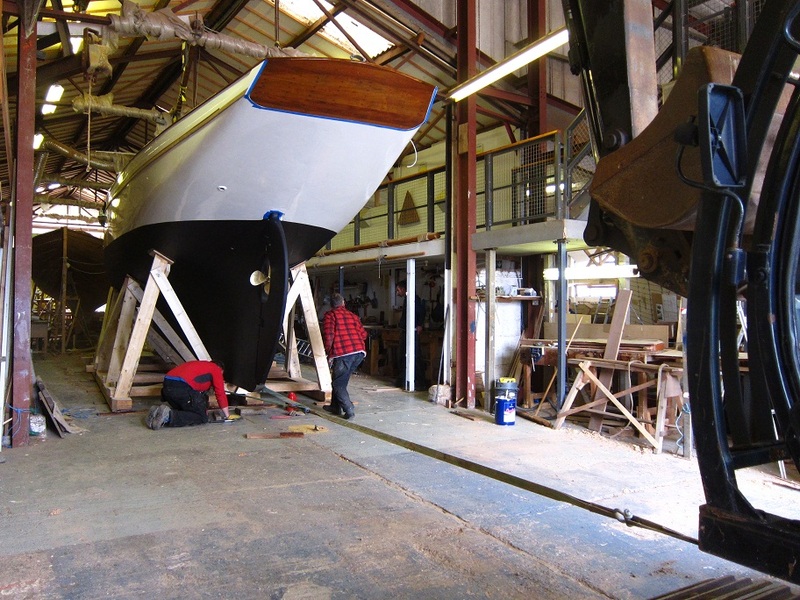 If you hang around long enough in the IBTC boat shed at the moment you get a job on Germaine. She’ s a beautiful Camper and Nicholsons cruising yawl, built in 1882, and has been in the boat shed since 1997; but not for much longer. 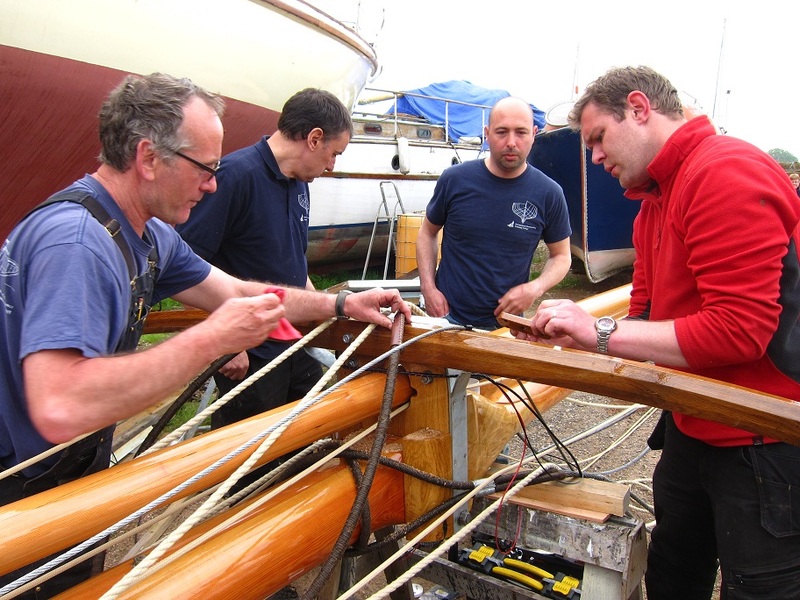 It’s all hands on deck to get her ready for the big day when she gets back in the water again. She’s taking shape rapidly, and I’ve been hoping that I would get the chance to do some work on her before she goes. One afternoon when everything on Naiad was either being bonded with Arbokol or was covered with wet varnish, I went and volunteered my services. The first task was fitting a galvanised steel band to her stem. It went on with a bit of persuasion using a 10 foot bit of 6 x 4 wedged in a groove in the floor of the boat shed as a shore and plenty of Arbokol. I was concerned that I might start the launch early as I levered the band against Germaine’s stem, but she stayed firm. The next job was to install an air vent in the coach roof, which required rather less brute force. 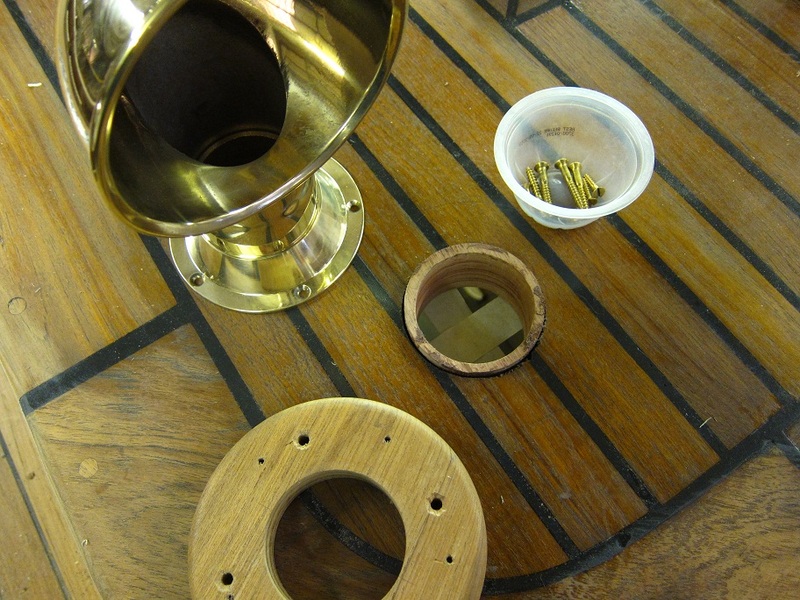 Starting with a lump of mahogany, the first task was to make a cylindrical insert that would look tidy and fit in with the beautifully crafted internal fit out. 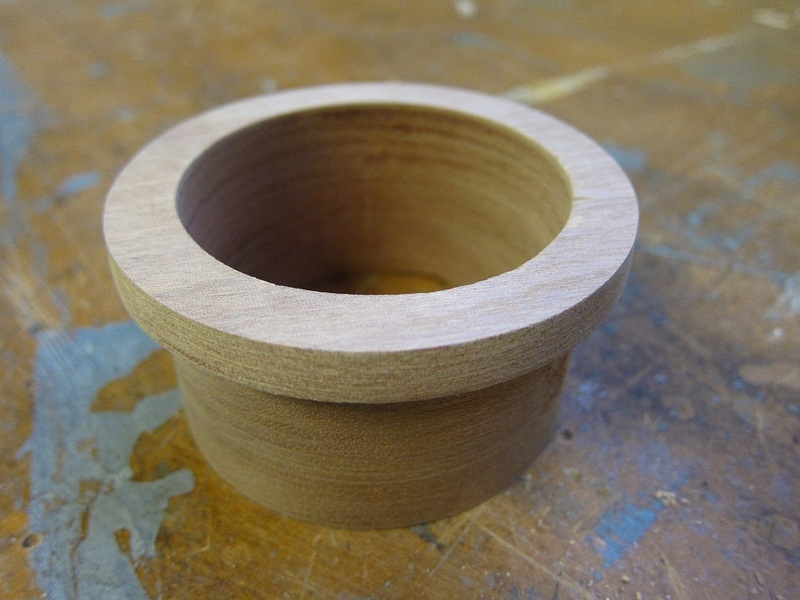 The outside profile was quite straightforward to cut on the lathe after getting the block of wood roughly cylindrical. Cutting the hole out of the middle was a delicate operation, as it would leave the walls of the tube quite thin and therefore there was a risk of it collapsing. I secured it in the drill vice and held my breath as I cut into it with a hole saw on the pillar drill. When I got half way through, I turned it over and drilled from the other end. It held together without collapsing and joined in the middle; not quite as major an achievement as digging the Channel Tunnel, but not far off. 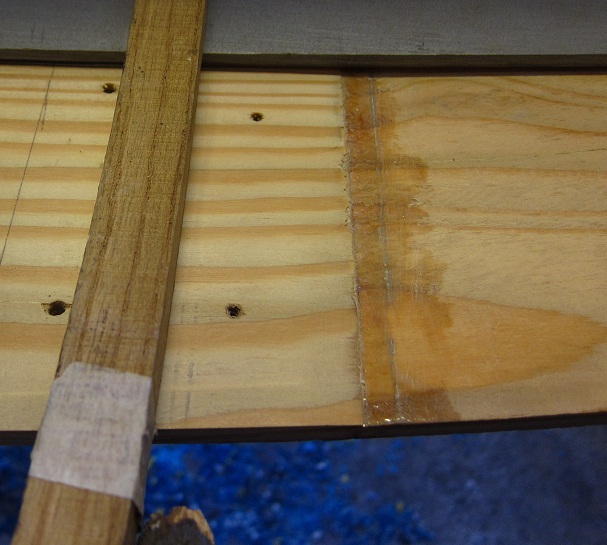 The next scary bit came when I had to use a hole saw to cut a hole in the teak deck on the coach roof to put the vent tube in; I must have measured it about 10 times before committing myself with the saw, but in the end I just had to get on with it. Cutting a big hole through the roof exposes end grain, so I sealed the inside of the hole with epoxy, and stuck the insert in with mastic. The rest of the job was straightforward and just involved screwing things together and sealing them with mastic. 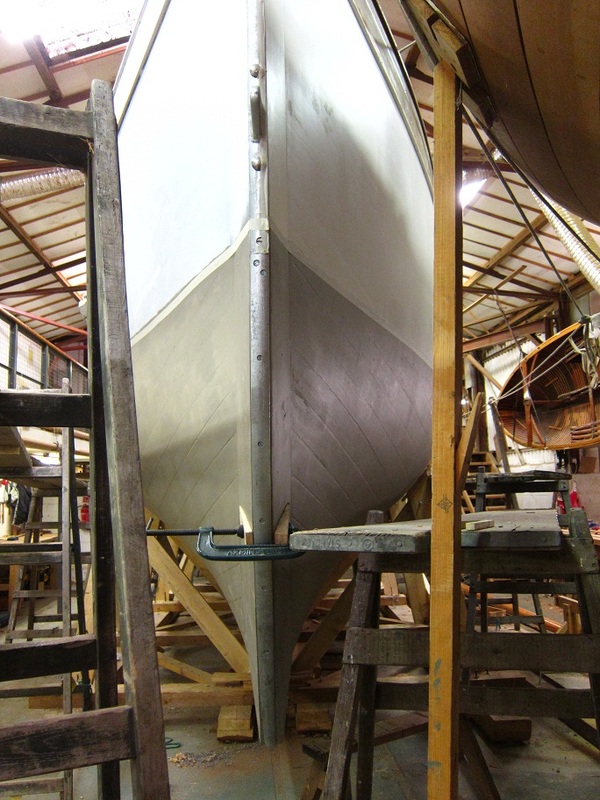 I’m looking forwards to Germaine’s launch next month; it will be a major operation getting her out of the boat shed, with lots of rearrangement of boats required. She will leave a big hole as she’s been an imposing presence in the boat shed for a long time, but I’m glad I got to do a bit of work on her before she leaves. 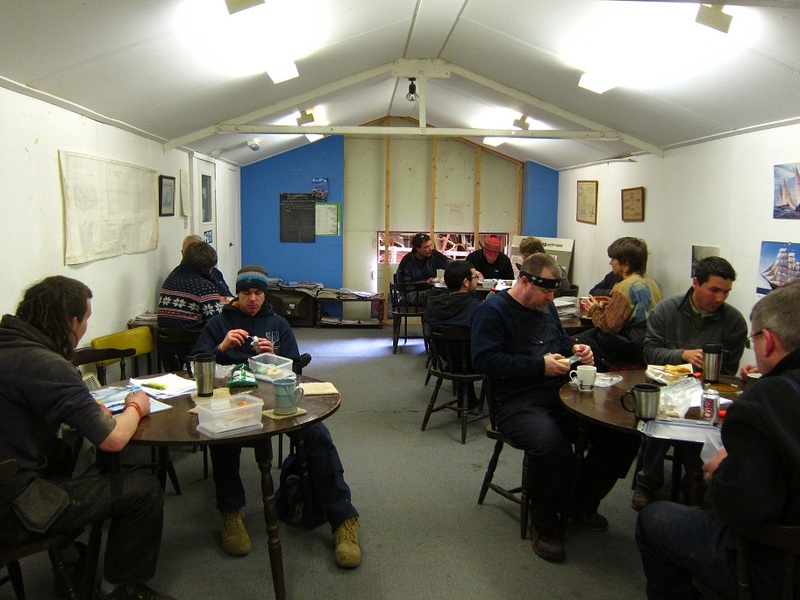 There was a leaving do at IBTC this week; every few months the college lays on some beer, wine, bread and cheese to launch another new batch of boat builders into the real world, it’s a fine spread and usually timed to coincide with welcoming a new intake. Class 113 started this week and we got to meet them at the first tea break on Monday. They came in looking a bit quiet and nervous as I’m sure we all did when we started, they got their teas and … horror! sat at the table reserved by the old lags; this is the table where the senior students sit and pontificate on boat building and the world in general while we all sit in awe. Sitting at their table with them would surely be frowned upon at the very least? 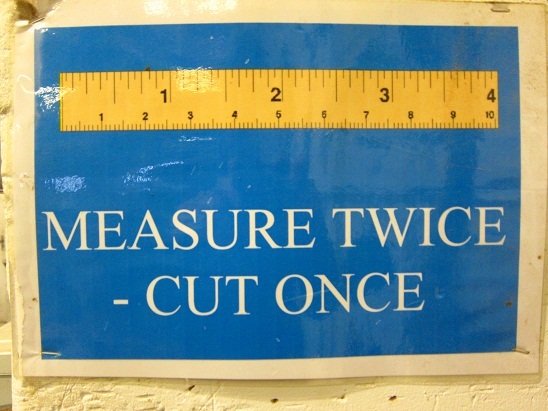 What would happen? Well … nothing; because it soon became apparent that there aren’t any seniors any more, or that is to say, we are them. So what advice could I pass on to the new boys from this exulted position? 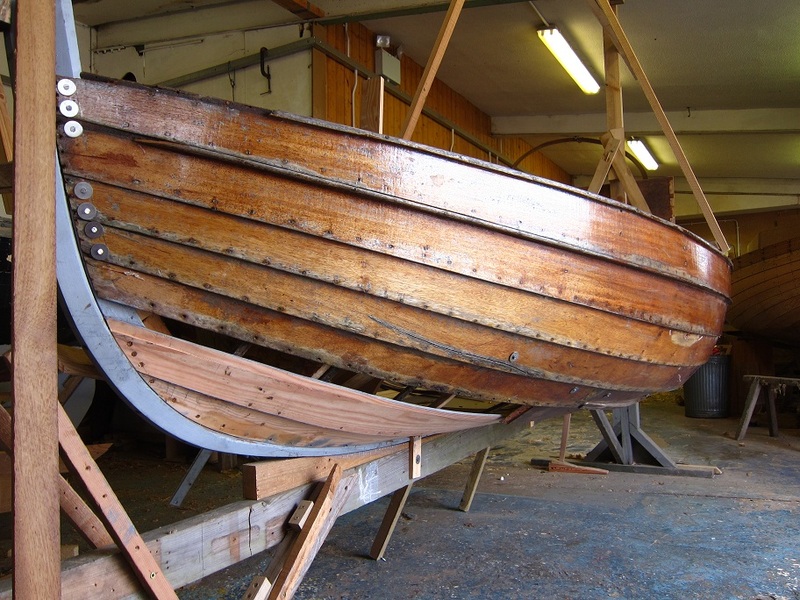 Apart from having a good supply of plasters (my thumb is still sporting a tatty one as I type) and Ibuprofen for back pain (if you’ve come from an office job), the main thing you need for boat building is patience. Michael and I have been working on Naiad for a couple of months now, every job seems to lead to lots of other jobs; there’s always something to snag, or varnish or prime before something else can be reassembled. Learning to do things in the right order helps, but even then it’s labour intensive and time consuming. 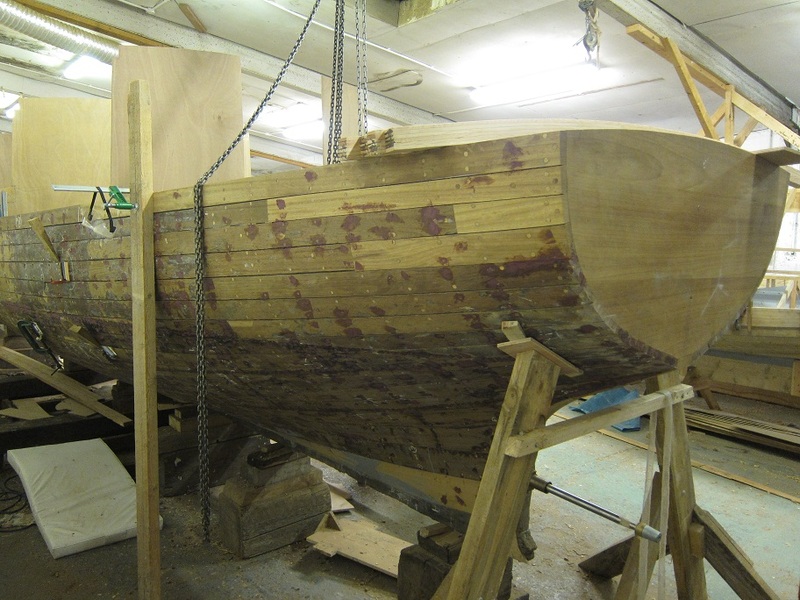 Naiad is gradually rising again from the rotted planks and timbers which made her so fragile when we first got on board. She’s quite robust now with new timbers and reconstructed centreboard case. The thwarts are nearly ready to go back in permanently when we’ve successfully aligned and drilled all the nail and screw holes through the knees, thwarts and risers to hold them all together. There’s plenty more to do, but it has become what we do all day; there doesn’t seem to be much progress day by day, but it all adds up, and we love it. One of the jobs I particularly enjoyed was rebuilding the thwart knees which had broken at each end. This was partly due to a fault with the original manufacture, in that they had short grain at the extremities, so were prone to snapping. But to be fair, they have been on the boat for a long time doing their job of supporting the thwarts. I made replacement ends from oak and bonded them on with epoxy. 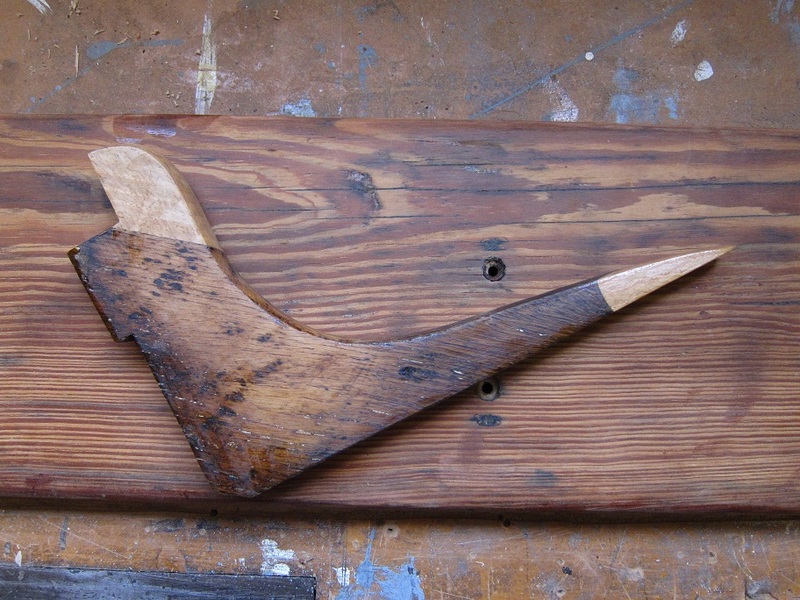 The top end has a tenon inside to support it, and the bottom end has a scarph joint. It’s still short grained at the thick end, but the grain runs along the bottom end. I wonder how long they’ll last before they need patching up again. “It says here ‘conservation importance HIGH’ ” shouted Michael, reading from the folder of notes on Naiad’s restoration. “What?” I replied above the din of the angle grinder I was using to remove a rove from one of the nails that holds Naiad’s clinker planks together; suddenly the super-heated copper rove flew off and landed on the back of my hand. Michael shook his head; “Just be careful”. 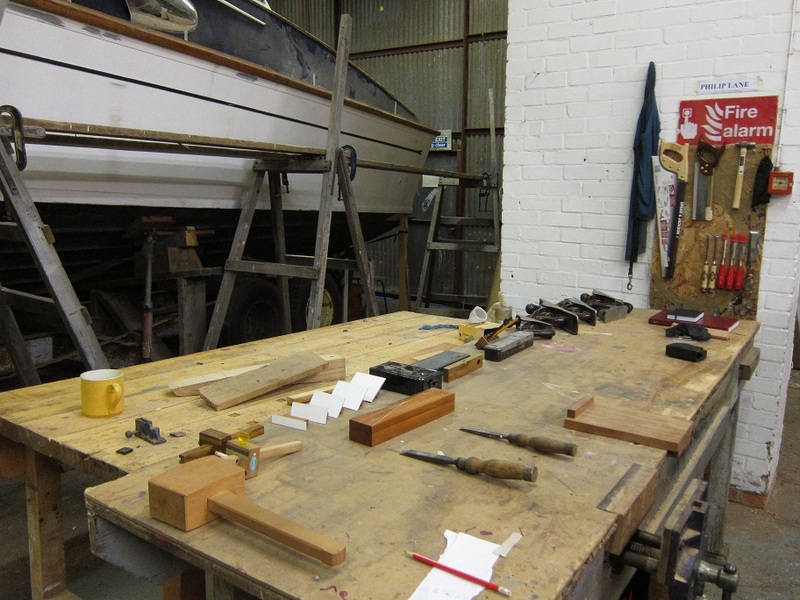 The first proper project that Michael and I have been given in the boat shed seemed to involve taking a boat to bits, rather that building it. 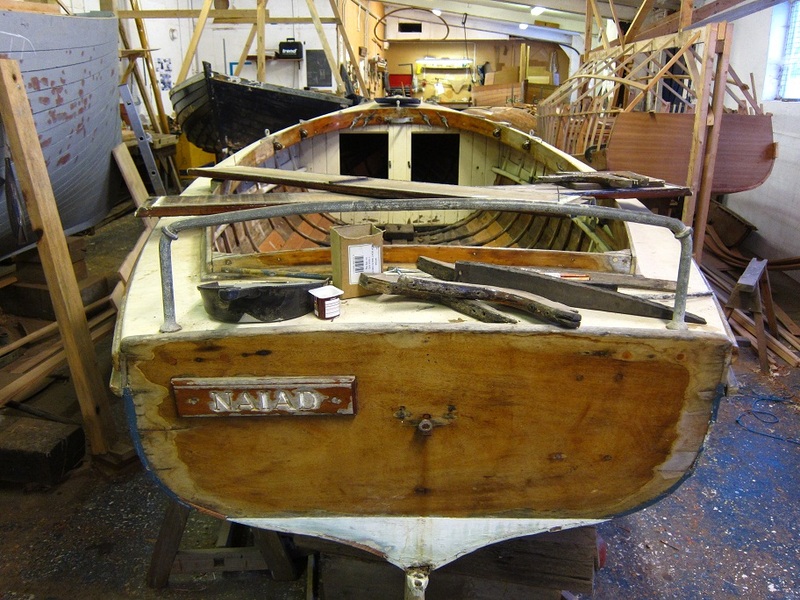 We had removed the thwarts and were now removing the old, damaged timbers from Naiad; one of few remaining Aldeburgh One Design dinghies built by Everson of Woodbridge. After removing the roves (carefully), one of us drove the nail through from the inside of the boat using a nail punch, while the other supported the plank from the outside and helped the nail out. Sounds easy, but we’re starting to expect complications with old boats, and of course many of the nails were bent, or inaccessible etc. so there was plenty to keep us occupied. 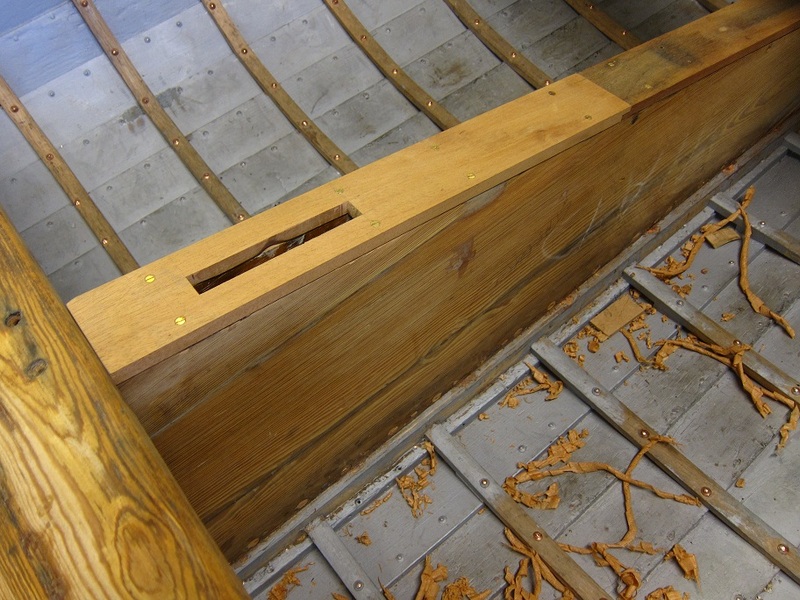 When we had pushed, pulled, coaxed and dug out enough nails that we could remove a few alternate timbers from one side of the boat (it’s important to keep enough in place to keep the shape of the boat intact), it was time for the exciting bit. I had previously imagined that a fair proportion of my time at IBTC would involve steaming wood into various interesting shapes, but it now seems apparent to me that steaming is very like painting, in that 90% of the time is spent in preparation and the main event is over in a flash. 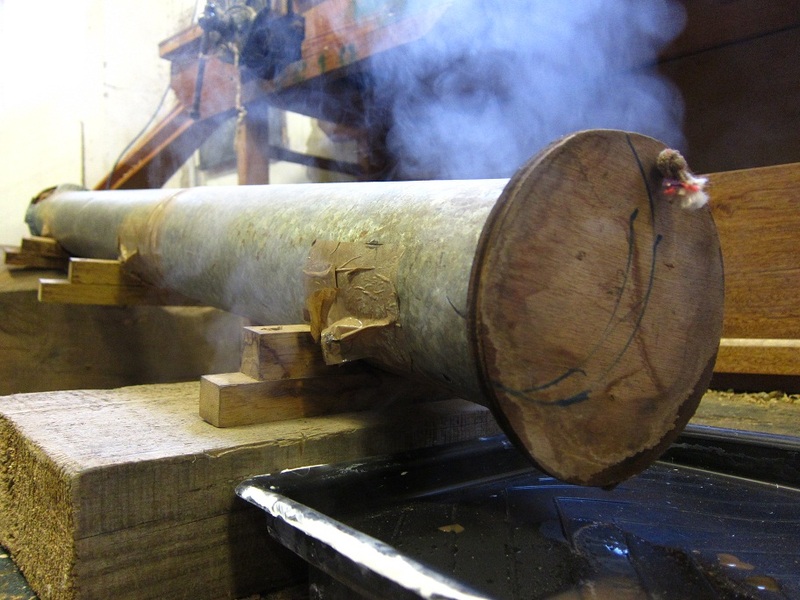 We fired up the steam box (a wallpaper steamer attached to a metal tube), and when it was hot enough, put our green oak timbers into the tube. Thirty minutes later, oven gloves at the ready, and Rob the tutor in attendance to make sure we didn’t mess it up, we pulled out our first hot timber. 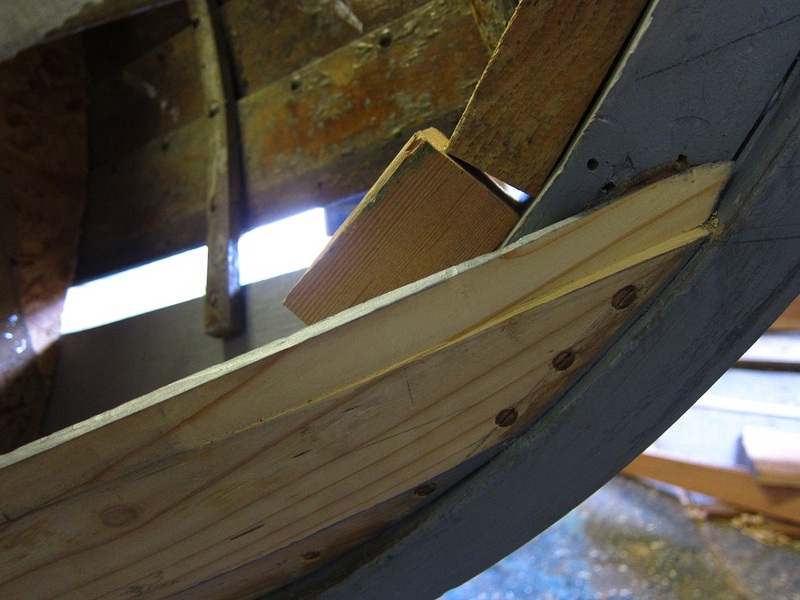 Michael bent it round his knee like an oversized piece of spaghetti and pressed it into shape inside Naiad’s hull while I screwed it into place from the outside; a temporary measure to allow it to take shape (the timbers will be nailed and clenched with roves later). We whizzed through our supply of timbers in the steam box and then stood back to admire our work. Now the process starts again; knocking out nails and scraping off old varnish and tar. 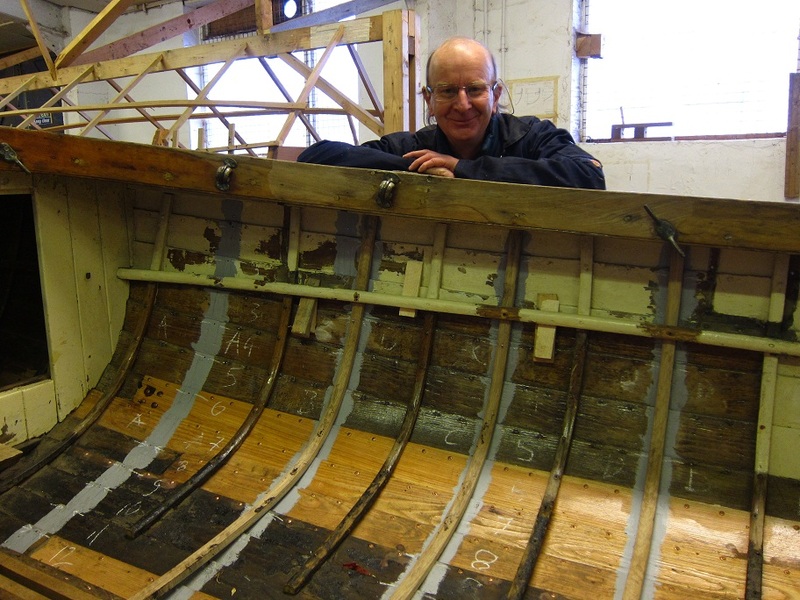 There are plenty more timbers to replace, but at least we’ve put some of the boat back together. 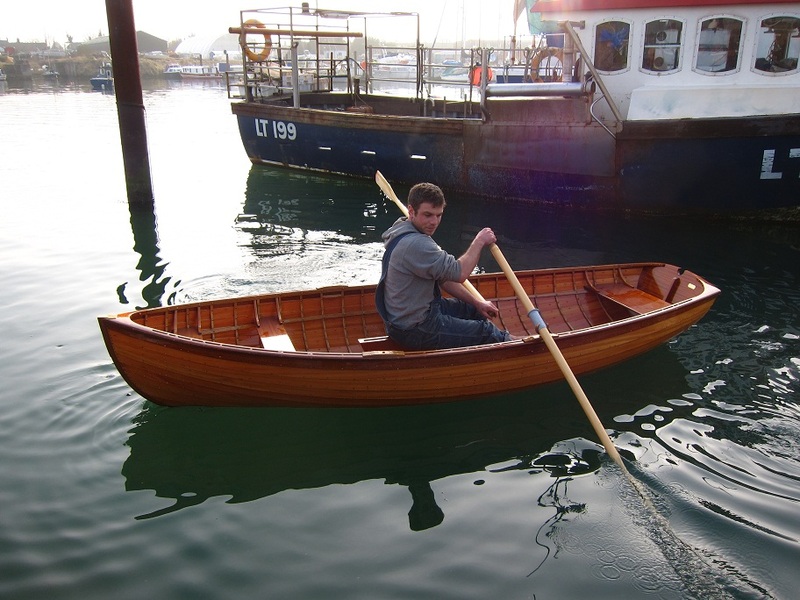 I’ve been working on a real boat at last. I moved over to the boat shed this week and started at the bottom. I spent Friday morning lying underneath the hull of Profundis doing ‘snagging’ work, which involves knocking the ends off wooden plugs with a chisel and filling holes with a combination of epoxy and microballoon filler. Once the snagging is done she’ll be ready for her first coat of primer. Profundis is thought to be an ex-Admiralty steam powered tender from around 1900 and is being converted into a weekend river cruiser. The name Profundis has some breadth as well as depth; it refers to the fact that she was rescued from the depths of the Thames at some point in her history; it comes originally from a Psalm (‘De Profundis’); which has inspired lots of works including several poems, album titles, the name of an extreme metal band and was the name given to a letter written by Oscar Wilde from Reading prison which contains plenty to reflect on from the floor of the boat shed.